Air pump is a machine which is used in the condenser to remove condensate air from the condenser. Basically,Air pump creates a vacuum in the condenser as nearly as possible, corresponding to exhaust steam temperature. It is used in the condenser to remove both air and condensate from the condenser. The pump which extracts both condensate and air is called wet air pump and a pump which extracts only moist air is known as dry air pump. In this page, we shall discuss most commonly used reciprocating type air pump which is also known as Edward's air pump.Rotary type air pump is also present in the market but it is not so popular. Edward's air pump or reciprocating type air pump consists of a delivery valve or head valve. There is no suction and bucket valve present in the Edwards type air pump which is essential in ordinary reciprocating type air pump. This delivery valve or head valve is present on the top of the pump barrel level, see in the Edwards air pump sketch. A flat reciprocating piston of the pump is placed on its surface and conical at the bottom shown in the picture. The pump Lever has a ring of ports around its lower end for the whole circumference. This lever ring port communicates with condenser. 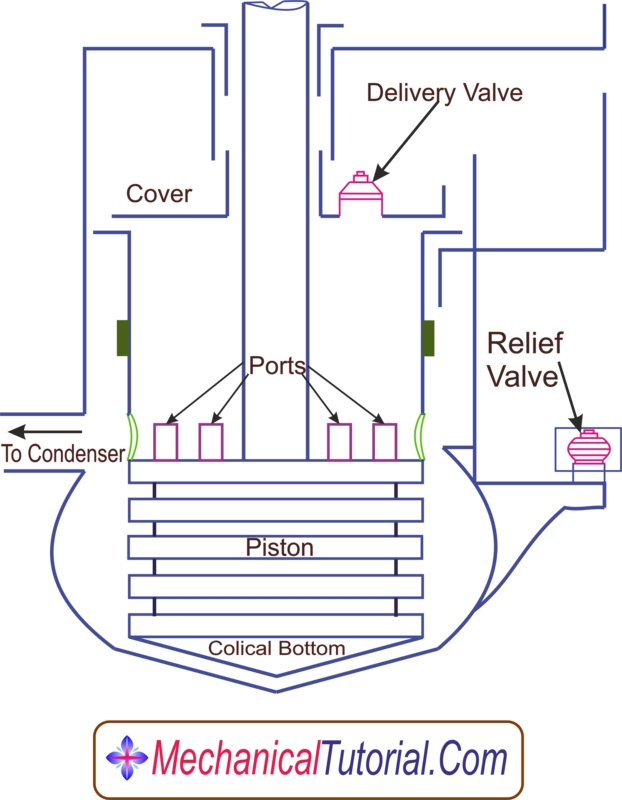 In the Edward's air pump chamber, when the reciprocating piston is at the top position the condensate and air from the condenser enter into the pump in the conical portion of the lower part of the barrel through the ports.It stores at the lower portion of the pump's chamber and at this positon covers the ports.Now the piston starts to fall down from upward position and a vacuum is created at the top of the piston due to head valve is closed by water.Now ports are open.Again piston moves at downwards, mixture of condensate, vacuum, and air enters at the top of the piston. This mixture is compressed and its pressure will be slightly above the atmosphere pressure when piston starts to move in upward direction. At this position deliver valve is open, which allow the mixture to pass on the top of the cover. A relief valve is placed in the base of the cylinder to release the pressure.